Flying aircraft is a coveted career in the United States armed services, and the process to become a military pilot is a competitive one. Most candidates need at least a bachelor’s degree to apply. The exception is the Army, where the fleet consists mainly of helicopters rather than fixed-wing aircraft. 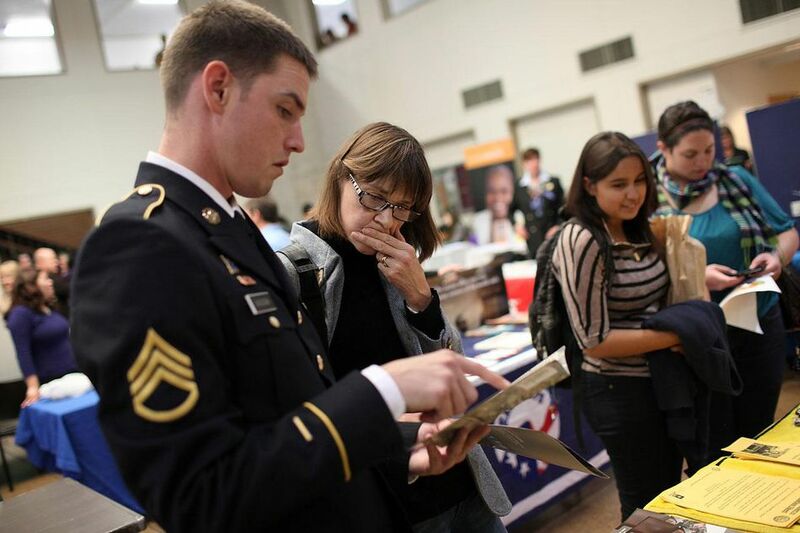 Becoming a in the Army does not require higher education or prior enlistment. The High School to Flight School program allows high school graduates to apply to become , a rank necessary to attend Army Aviation School. To get into that fast-track program, you must write an essay, get letters of recommendation, and meet the same requirements as every other Army flight school candidate. You need to be at least 18 years old when you enlist in the Army, and you have to appear before the military board that selects candidates for flight school before turning 33 years old. If you are 33 or 34, it is possible to get a waiver. If you meet the first two criteria, you’ll face a battery of aptitude tests. You’ll have to take the revised Flight Aptitude Selection Test and earn a score of at least 90. In addition, your general technical score on the Armed Forces Vocational Aptitude Battery (ASVAB) tests must be 110 or better. You’ll have to meet the Army’s . There are also two levels of physicals you must take: the one that every Army recruit takes at a military entrance processing station (MEPS) and an additional Flight Class I physical, to be approved by flight surgeons at Fort Rucker. You can’t have vision worse than 20/50 in either eye. To remain on flight status after training, pilots can’t allow their vision to deteriorate beyond 20/400. You can’t be colorblind or have problems with depth perception, either. All physicals need to be done within 18 months before the selection board meets to weigh your qualifications for helicopter pilot school. If accepted, first you’ll have to attend nine weeks of and six weeks of warrant officer candidate school. A warrant officer is a technical expert who specializes in a particular battlefield skill, such as flying choppers. Unlike commissioned officers, they continue working in their specialty, rather than moving up the chain of command. Once through with warrant officer candidate school, you’ll proceed to the flight training program at Fort Rucker in Alabama. The program begins with classroom instruction on the intricacies of rotary-winged aircraft. You will learn basic flight physics, flight systems, emergency procedures, and you will learn how to draw and read flight maps. The training advances quickly to Warrior Hall, where new pilots learn to fly helicopters in simulators with spider-like metal legs. Once you have 7 1/2 hours of simulator time under your belt, you’ll learn combat maneuvers used by Army pilots in trainer TH-67 helicopters. Then you’ll become an expert in one of four helicopters: the OH-58 Kiowa reconnaissance aircraft; the UH-60 Black Hawk, built for medical evacuations and search and rescue missions; the , the Army’s primary attack helicopter; or the CH-47 Chinook, a transport chopper. Depending on the type of aircraft you specialize in, you’ll log between 70 and 150 hours of actual flight time before becoming a helicopter pilot. You will also be taught how to fly with night vision goggles mounted on the front of the flight helmet, which limits your field of vision to 40 degrees. The entire program typically takes a year. Once you have mastered flight school and the chosen aircraft, you will then be assigned any of more than two dozen Aviation Regiments in the Army, Army Reserves, or Air National Guard. The best of the best Army pilots and crew members tryout for the Army’s Special Operations Aviation Regiment - The 160th SOAR – The Joint Special Operations Command (JSOC) flies MH-47G Chinooks, A/MH-6M Little Birds and MH-60M Black Hawks. Army helicopter pilots – active duty as well as Army Reserve / Air National Guard deploy frequently when there are missions that require air strikes, ground troops such as the infantry and special operations soldiers they support. Typical deployments to areas such as the recent Iraq and Afghanistan Wars range from 9-12 months long. An Army pilot typically is stationed with the infantry unit they specifically support. For instance, if a pilot is attached to the 25th Aviation Regiment, the 25th Infantry stationed in Hawaii is where the pilot as his/her family would live. If in support of the 10th Mountain Infantry Division, the 10th Aviation Regiment would be stationed in Fort Drum, New York. Where you find Army ground troops, tanks, and artillery, you will find Army Aviation units on direct fire support, medical evacuation, or personnel transport missions. The Army will home base its pilots at the large variety of Aviation Regiments throughout the world. Such as Fort Riley, Kansas, Wheeler Army Airfield, Hawaii, Fort Bliss, Texas, Joint Base Lewis-McChord, Washington, Fort Drum, New York, Fort Bragg, North Carolina, Camp Humphreys, South Korea, Fort Campbell, Kentucky, Hunter Army Airfield, Georgia, Fort Carson, Colorado, Fort Hood, Texas and many other locations.